Before Rome was sacked for the last time the empire had split into two separate dominions: the Western Empire headquartered in Rome and the Eastern Empire in Byzantium (modern day Istanbul, Turkey). The fall of the ancient Roman Empire can be attributed to many causes but the increasing popularity of Christianity was no doubt a major contributing factor. Christianity is a monotheistic religion, where one God exists in three unified ‘persons’: God the Father, God the Son of Man (Jesus Christ), and God the Spirit. In 313 AD Emperor Constantine petitioned for the Roman Empire to become two separate dominions. Byzantium would be the new capital of the Eastern Roman Empire, of which he would be the Emperor. He changed the name of the capital to Constantinople in his honor and declared himself a Christian becoming the first Roman emperor to do so. Constantine’s predecessor declared that Christianity become the state religion of the Eastern Roman, or the Byzantine Empire. The Byzantine Empire would expand to nearly the size of the Ancient Roman Empire and would single handedly spread the Christian religion across Europe, Russia, Near East and Northern Africa. Portrait of Emperor Constantine. The first Roman ruler to establish Christianity as the state religion. 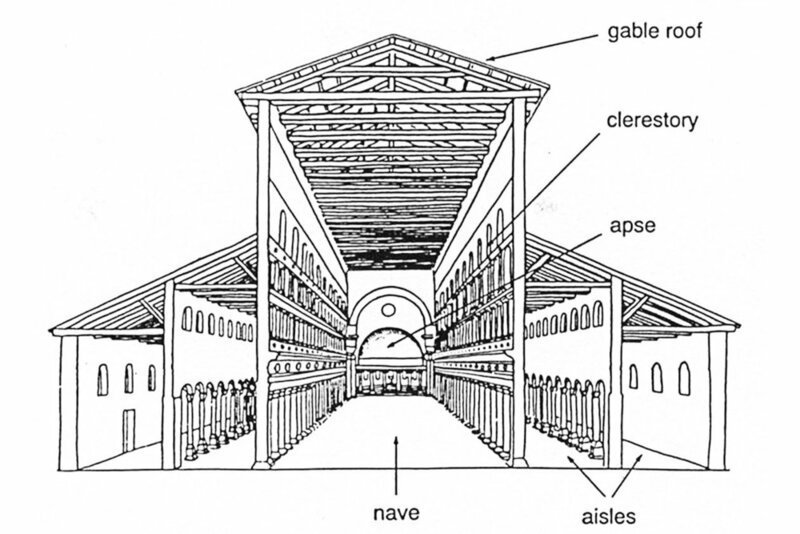 The basic components of a basilica plan church adapted from its Roman ancestor building. Christianity became a very processional religion. It became a worship of pageantry, reciting, and choral singing. This new religion and its functions needed an architecture to support it. It needed a spatial model to help spread the "good news" across the known world. The solution to this architectural problem would prove to be one of the most influential and repeated design paradigms in the world, even into the 21st century. Christian followers were persecuted by Romans early on and had to hide worship in private houses. By the time Christianity became the official religion of the Byzantine Empire, there was no official building for Christian worship. To satisfy this need, Byzantine rulers simply used pagan building types from the previous empire and adapted them as the first church buildings. The Roman Basilica was of notable influence. Its tall, long, and flexible floor plan proved to be a perfect match for Christian worship and would become the primary space of the Christian church. This is why the largest Catholic church in the world is called a ‘Basilica’ and not church - St. Peter’s Basilica in Vatican City, Italy. The nave, as it would come to be called, needed a few essential components to make it complete. The apse was added, a semi-circular focal space where the orator and the liturgical chorus would stand, essentially a stage. It was placed at one end of the basilica, or nave, to terminate the procession. Placed parallel to the Basilica, were long but shorter spaces called aisles. They gave access to the viewing areas in the nave. The model for Christian church architecture would receive many nuances and expressions of ornamentation over the next 1500 years. But no matter how varied, these three components, the Nave (Basilica), Apse, and Aisle, would remain essential parts to Christian liturgical spaces and churches. Good examples of early Byzantine christian architecture are Old St. Peter’s Basilica, Aula Palatina commissioned by Constantine himself, and the church of Santa Maria in Trastevere. The Basilica of Constantine in Trier, Germany. (also called Aula Palatina) built by the Emperor Constantine in 310 AD. It's one of the largest remaining halls from antiquity and a great example of early Christian Church design adapted from a pagan Roman building type. Elements of the basilica are easily seen. 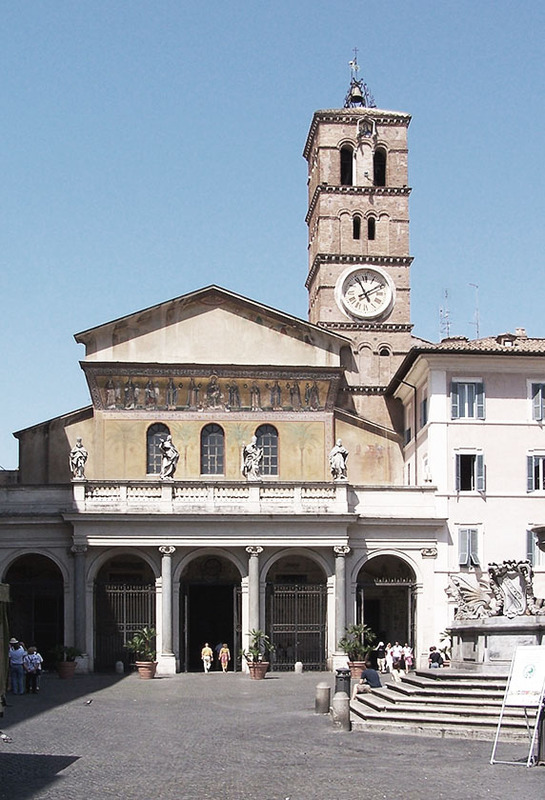 The Basilica of Santa Maria in Trastevere, Italy is one of the oldest basilica churches in Rome dating back to the mid 4th century. I got a chance to photograph and draw the church when I visited Italy. the section I drew shows the church's architectural foundations as a Roman Basilica with the high central nave space and a rounded apse at then end where the altar is located. Byzantine architecture also produced the circular planned domed church - an idea undoubtedly influenced by the pagan Pantheon in Rome. In floor plan, it's a building essentially comprised of two apses’ pushed together to form a full circle with a dome over its central space. In these churches, the nave (basilica) and the Apse (or altar) share the same space. An additional circular ring wrapped around this main central space serves as the access aisle. Domed circular plan churches allow more attention to be placed on the altar and provide better viewing for all patrons. There were many more traditional basilica churches produced than circular basilicas. But circular domed churches produced some of the world’s greatest buildings and would be the precursor for many future buildings. The church of Santa Costanza (4th century) in Rome is a great example of an early modest circular plan Christian church. But the Hagia Sophia (6th century), in Istanbul is without a doubt one of the most fascinating buildings of any kind and of any period of architecture. For years it was both the largest church in the world and the largest masonry domed building the world. 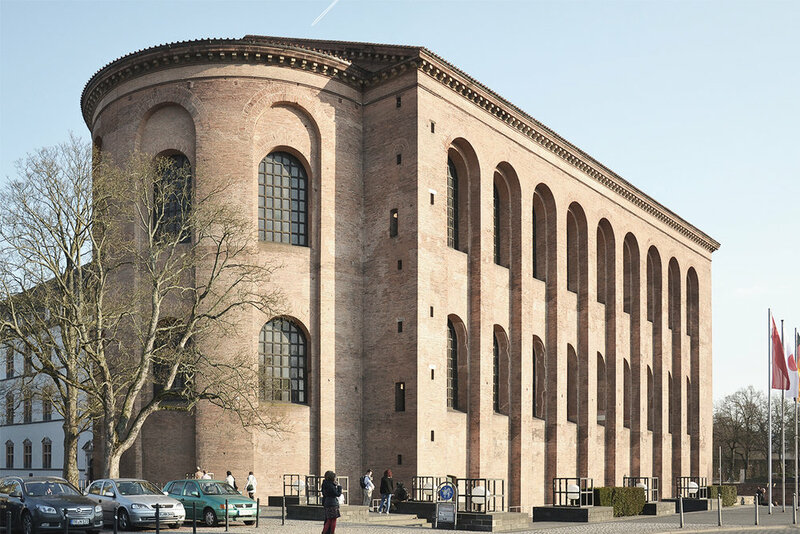 The idea behind this iconic building was to merge the circular basilica plan with the rectangular basilica plan creating an ideal worship space. Now a museum, Hagia Sophia is rich in cultural history as the grandeur of its space has played host to a Christian church, a catholic church, and a Islamic Mosque. 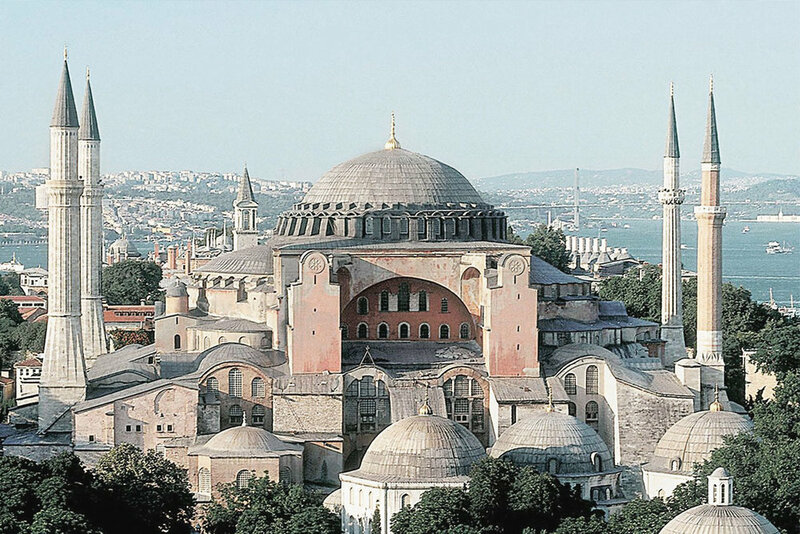 Hagia Sophia in Constantinople (Now Istanbul) is the largest circular plan church ever built. Located in an active earthquake zone, engineers still wonder how people of the day were able to build such a structure.It was built in the 6th Century and is the crown jewel of Byzantine/Eastern Orthodox Christian Architecture. The basic components of Gothic Architecture and the Gothic Cathedral. Pointed Arches, Flying Buttresses and Ribbed (Fan) Vaults were the main components that allowed for tall and light looking structures. Europe after the fall of Rome, would experience the Middle or Dark Ages. The Medieval period represents a time where vast amounts of knowledge, technology and history were lost. This dark period would continue until the Moors and other African/Arabian empires would reintroduce these ideas back into the continent. But there were still a few major architectural developments that happened during this period. The Romanesque architectural style flourished in many independent Italian States that came to power. Romanesque architecture is defined by the excessive use of the stone arch in both the interior and the exterior of religious buildings and palaces. However, the most significant architectural development during this time was the Gothic Architectural Style. Churches were traditionally very solid, opaque and heavy looking. 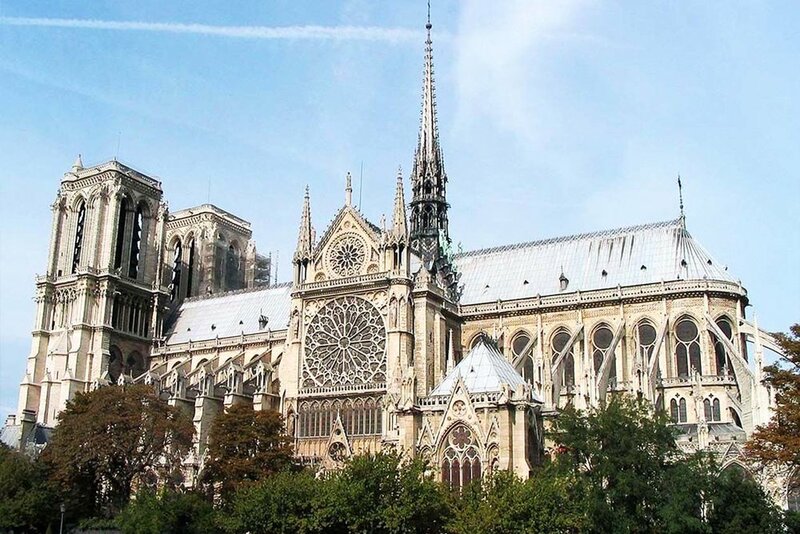 Developed first in France, Gothic churches were more structurally efficient and expressive. This allowed churches to be taller and contain unprecedented amounts of glass, producing magnificent interior spaces. These feats were made possible by three key components: pointed arches, fan vaults, and flying buttresses. The soaring arches and vaults were self supporting, marking some of the first instances where the structure and veneer (or skin) of a building could be independent of each other. However, the arches and vaults produced very strong outward thrust forces. If not controlled they could cause these massive structures to collapse. To hold the nave and the rest of the church together, flying buttresses were attached to the exterior. They provided strong oppositional forces to counter the arches outward thrust. Gothic architecture seems to have been influenced by Islamic architecture and Mosque design. This can be debated. What is fact is that the developments of Gothic architecture are the very early foundations for what would become 'Modern Architecture'.